This is about six months too late to be prescient or even topical, but I wonder if the failure of Jeff Merkley and Tom Udall's attempts to restrict filibusters was partly an artifact of which Senators were up for re-election when. The beginning of the 2012 session was an inopportune time to pass the legislation, and things will look a lot better a few years from now. In 2012, the partisan composition of the Senate class up for re-election will be 21D-10R. In 2014, 20D-13R. Even if the electoral climate in these years is neutral, we stand to lose seats. We finally have a serious shot to gain ground in 2016, when it's 10D-24R. So I can imagine a bunch of Democratic Senators sitting around back in January and thinking, "Why should we pass filibuster reform now? If Republicans take the Senate in 2012 or 2014, it'll just be used against us. And anyway we can't actually pass anything with a big GOP majority in the House. So yeah, filibuster reform is a good thing that should happen, but let's wait on it." If this is right, it was a good thing for Merkley and Udall to at least talk to their Democratic colleagues about filibuster reform after the 2009-2010 Congress while sentiments in favor of it were high, even as the tactical case was at its ebb. Maybe in 2015 or 2017 when the tactical case is huge and sentiment is weaker, they'll be able to remind people how they used to feel in late 2010. There is filibuster reform, and there is filibuster reform. Not all of it is simply a gimme to whichever party controls the Senate, and it's also worth taking into account which tools of obstruction the Dems would have used more than occasionally. 1) The motion to proceed should have been made non-filibusterable. Look, we want the public to know what is being debated in Congress. That's to our advantage, year in and year out. The more that debate takes place on the Senate floor, rather than in backroom talks to line up 60 votes to invoke cloture on a motion to proceed, the better it is for our side. 2) The clause that allows the minority to require 30 hours of debate after a cloture motion is passed should have been eliminated. 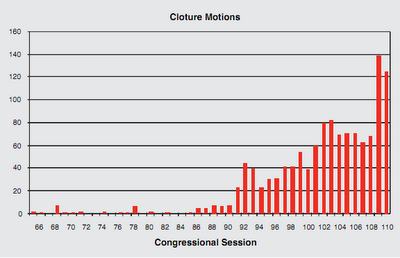 Nowadays, if you've got 60 votes for cloture, the debate's over and there's no need for another 30 hours. And it's not the sort of thing the Dems would make good use of as a tool for obstruction. I can understand why the Dems didn't eliminate the filibuster, or make it easier to invoke cloture on passage of a bill itself. But they should have gotten rid of this other stuff. Maybe I'm wrong and the Dems will use these two rules to their advantage if they find themselves in the minority in 2013 or 2015. But I'd be willing to bet non-trivial amounts of money that they'll rarely if ever use these rules to their advantage in ways that wouldn't have been satisfied by simply filibustering bills. And it would have also re-established the precedent that a majority can change the goddamned Senate rules once every two years, if not more often. This makes sense to me, cyclist.